It has been said that life is a dance. No one knows that better than celebrated Canadian dance artist Peggy Baker whose dance installation Move captures the duality of caregiving. The free installation will be performed on Feb. 2 at the Art Gallery of Hamilton as part of McMaster University’s Socrates Project. The dance installation takes place in a 28 by 28-foot square surrounded by a frame. It is 70-minutes long and is organized into four cycles. The cyclic nature of the piece and the fact that it rotates throughout means audience members can take it in from multiple angles. The performers are not necessarily dancers by trade but members of the community who love dance. There are 16 of them dancing in pairs that reverse roles with each cycle. 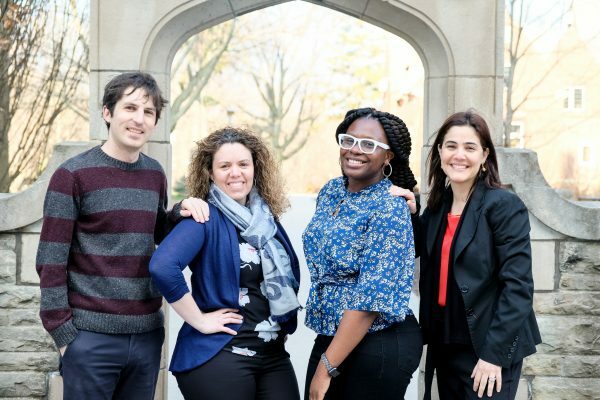 They were selected in November 2018 during a two-hour workshop and audition. 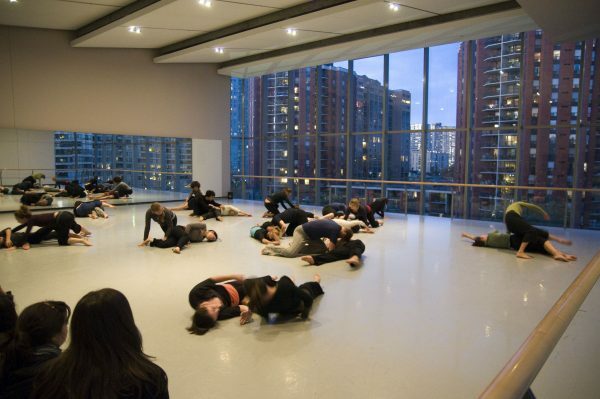 The story of Move began 10 years ago when Baker first presented the dance as part of Toronto contemporary art event Nuit Blanche. At that time, the dance was 20 minutes long and done on the hour every hour for 12 hours with 12 pairs of professional dancers. When Baker put on Move for the second time at the Art Gallery of Ontario a couple years later, she decided to extend the length of the piece and do it with fewer dancers. It was while doing the dance at the Art Gallery of Ontario that Baker thought about using community members as the dancers. She has since put on several performances of Move with non-professional dancers, staging the entire performance in five three-hour rehearsals. Baker’s own experience with caregiving formed a part of the inspiration for the installation. She was the primary caregiver to her late husband, who had primary progressive multiple sclerosis. She found that caregiving involves a beautiful rapport between the one receiving and the one giving care. Baker was also inspired by art and dance itself. While teaching in Philadelphia, she was struck by the beauty of partnership when she had dancers pair up and help another during some difficult movement sequences. Also while in Philadelphia, she saw an exhibition of paintings by American painter George Tooker and was inspired by the images of people embracing one another. The dancers changing roles throughout the piece represents the inevitability of being on both sides of caregiving. 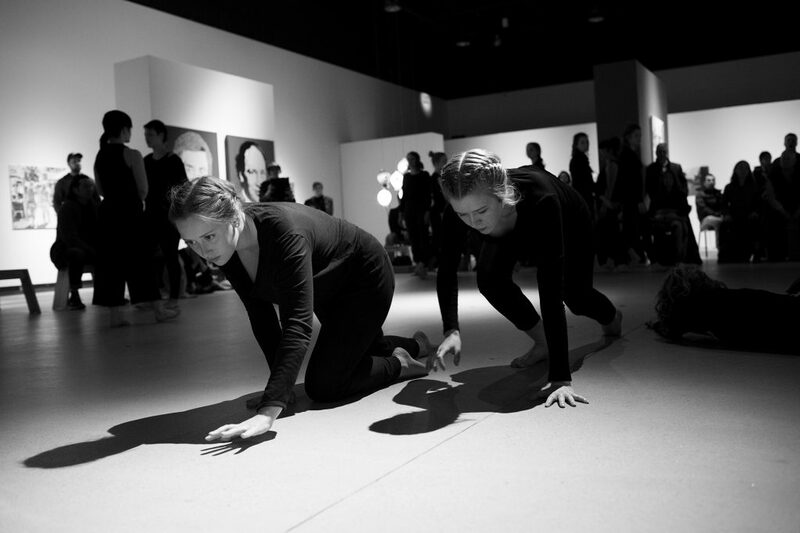 The choreography for the piece overall is formal and highly organized, mimicking the ritualized elements of human lives. The choice to have four cycles mimics the cyclic structure of the seasons and the fact that there are four cardinal directions. “[I]t’s something universal. We all receive that kind of intimate physical care and physical nurturing as infants and children. We may all find ourselves in a position where we where we are called upon to give care to a parent or a partner or a child. And we may all eventually need to receive care,” explained Baker. The electro-acoustic soundtrack, composed by musician and composer Debashis Sinha, is also organized into four cycles. It is subtle and atmospheric, not quite music but a sonic landscape for the audience and dancers to reside in. 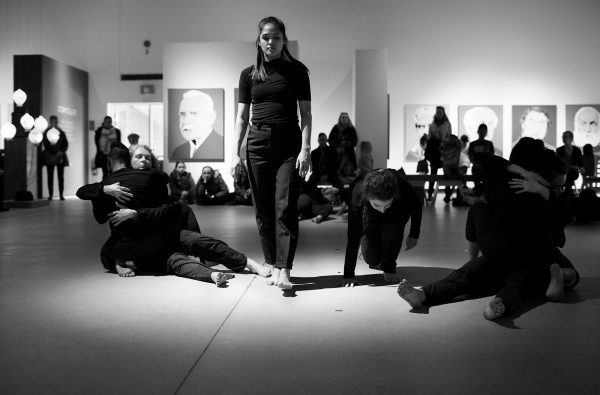 Baker encourages audience members to walk around the square performance space, close their eyes or turn their back to view the art in the gallery. The space allows viewers to feel comfortable arriving after it begins or even leaving before it ends. “I like it to be in a public place. I like it to be in a place that already is claimed by the community as being a place in their town or city like this is… an art gallery, a foyer of a theater, a market… [I]t needs to locate itself in the heart of the community… [I]t’s about community building basically,” Baker said. At the end of the piece, the dancers pour water for one another and drink it. One of the dancers in the group, a ceramic artist, suggested that the group each makes the vessel that they drink out of. At the end of one of their rehearsals, she guided her fellow dancers through making their own bowl. The creativity and passion brought on by these community dancers give this installation of Move a unique tint. However, the beauty of Move is the universality of the theme and the way in which it can move anyone.